A chance meeting at a party, and we found ourselves driving to the Extremadura region of Spain to help prune grape vines. 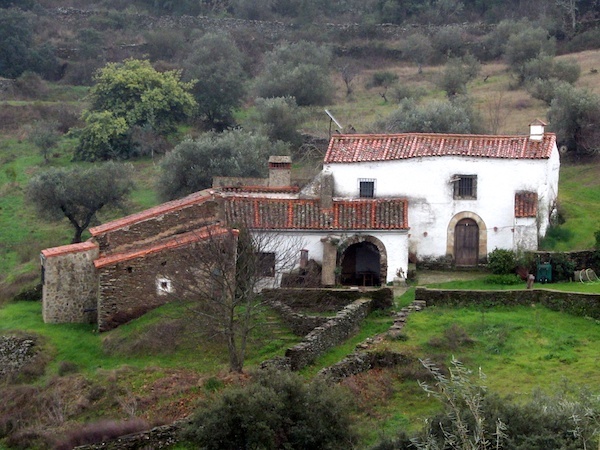 Extremadura lies to the centre of the country, butting up against Portugal. It is effectively a desert, with high summer temperatures and frequent droughts. These conditions are excellent for the production of wine, particularly dark reds from tempranillo and garnacha grapes, and our friend John needed a hand pruning his vines ahead of the spring growing season. John has thousands of vines, and a competent person can prune about ten an hour, so there was a lot to do, especially as Bronwyn and I were complete beginners. However, John was a patient tutor and we soon got the hang of it. There is a lot more to vine pruning than just hacking off the old growth. You have to evaluate the state of the vine, try to figure out what the last pruner was trying to achieve, make your own decision about what you want to achieve in terms of the number of branches and the direction that you’d like them to grow in, and then cut away everything that gets in the way of your chosen result. This includes cutting away useless suckers and last year’s stumps, sawing off failed branches, stacking stones under the trunks so that they don’t sit in ground water, and judiciously knocking off any tiny buds that will ruin the final shape. It’s not physically hard, but mentally more taxing than you would think, and sometimes we found ourselves sitting down next to a plant and talking to it while we tried to figure out the best way of encouraging it to grow a good crop. The days quickly formed a pattern which went: Drink wine from the vat and laugh until the small wee hours; sleep til midday; prune vines til dusk; repeat. John also makes some excellent olive oil, but some of the eating olives had been sitting in brine for too long, so Bronwyn spent a pleasant afternoon rinsing and re-packing them. We did also find time for some long tramps around the countryside, and for foraging trips to the local markets. On one rainy day when pruning would have been a chore, we climbed up to a Roman dam that had been built at the top of a local creek. Despite the soaking wet foliage, we attempted a cross-country route which took us hiking through ancient olive groves and clambering over fallen rocks, discovering on the way an old embankment which might just have been the Romans’ original construction road. After some laughs and spills, we did finally make it to the dam, which is in remarkable condition considering its age. There is a slot that obviously used to contain a sluice, which has been slightly widened out at the bottom by thousands of years of erosion. This entry was posted in Europe, Spain, Travel and tagged Wine on 2014/01/29 by Reinhard.